Edit 9/17/2017: It has become clear now that Myanmar's government has launched a violent campaign against the Rohingya people, a Muslim minority in Myanmar. The rapes and killings have been denounced by the international community as a "textbook example of ethnic cleansing," with more than 400,000 Rohyinga fleeing their homes into Bangladesh. Aung San Suu Kyi has yet to speak out against the violence. I loved the time I spent in Myanmar, but I am horrified at the human rights abuses that continue to take place in this country. If Myanmar is on your bucket list, please think long and hard about how you can be an ethical traveler in this country. I'm not sure it's possible, given the current state. Myanmar is the most culturally rich, intriguing, and mysterious country I have ever been to. After fifty years of military rule and brutal civil wars, democracy has finally found its foothold here, fueled by the efforts of its young people and the country’s widely sung hero, Aung San Suu Kyi. In 2013, with general elections taking place and US economic sanctions being lifted, the curtain that had hid Myanmar for so long from the rest of the Western world fell away, and its borders officially opened to tourists. Five years later, despite being one of the poorest countries in Southeast Asia, Myanmar is moving forward with a promise for the future. This is a country in which its people have always fought to not be forgotten. And the backpackers who have made the journey here insist that this is a country they will never forget. I agree. Myanmar has already captured my imagination, and its people have captured my heart. With a full day ahead of me before leaving on a night bus bound for the temples of Bagan, I wanted to get outside of Yangon, Myanmar's old capital. Yangon's train station is in the middle of downtown, easily accessible by locals and tourists (the few that are here, anyways). 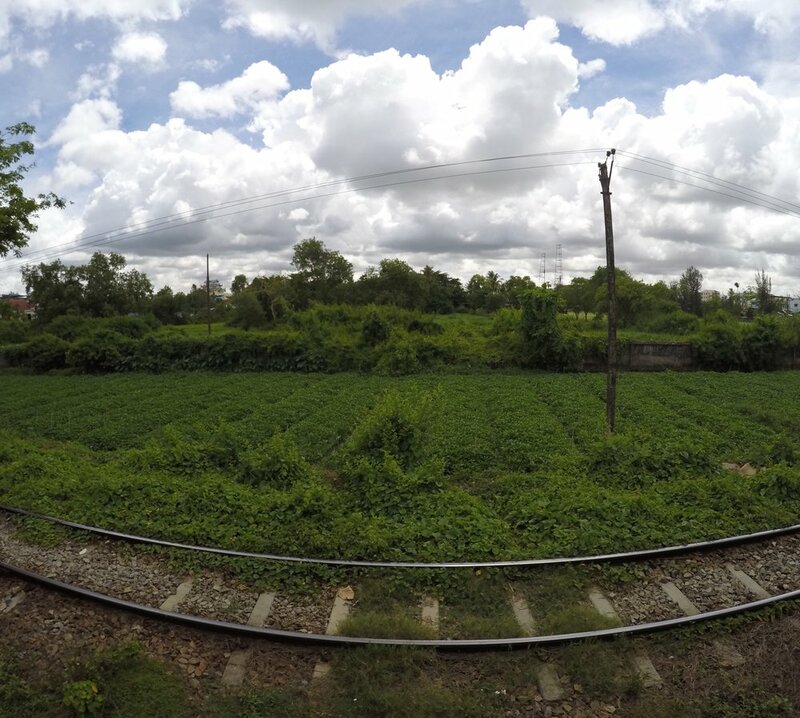 With trains bound for northern and southern Myanmar from the main artery of Yangon's central station, there is one train that makes a full circle around Yangon. 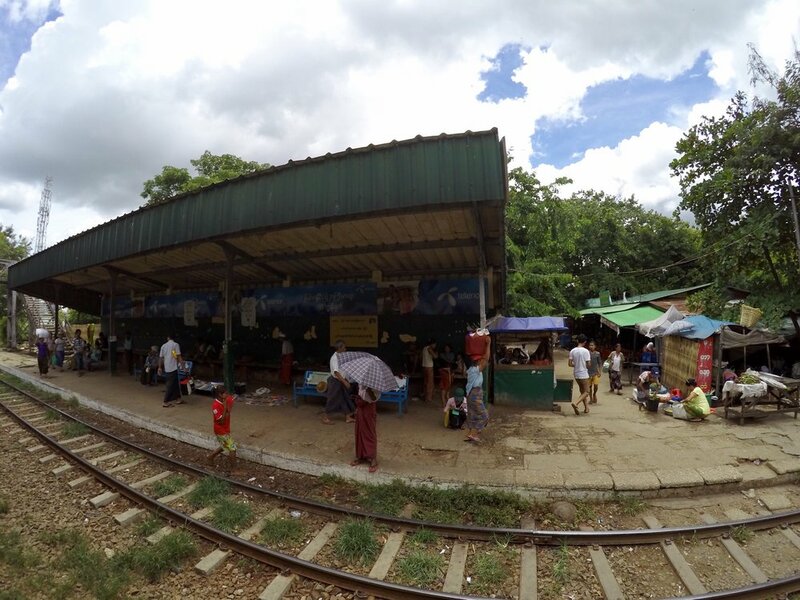 For 200 Kyat (.12 cents USD), I board the train for a three-hour journey around the outskirts of Yangon. The train itself has open windows and doors. When it starts pouring halfway through the journey, the rain rushes in through the windows. There are no announcements for any stops. Each platform sign is marked in the Burmese language, its alphabet formed with curves that make interweaving shapes. The English translation is faded beneath it, if there is any translation at all. As the train moves through the center of the city, the car becomes more crowded. 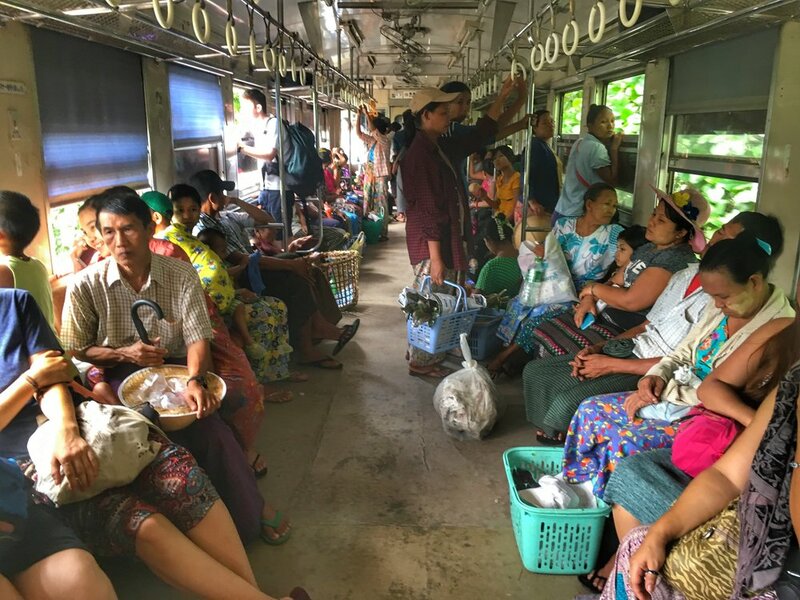 Burmese men sit on the steps of the train's exit, while women sit with their babies on their laps. Children with lollipops rest their chins on window sills, watching the landscape go by. Some Burmese have cell phones to pass the time, but most don’t; Myanmar’s first cell phone provider only came into business two years ago. At the beginning of my Myanmar journey. Two Burmese men waiting for their stop. Planting fields alongside the tracks. A colorful market in the midst of a downpour. At each stop, Burmese selling lychees, limes, cigarettes, eggs, and mangoes get on and off the train. They yell in Burmese, stopping every few seconds when someone waves them down. I try to buy a handful of lychees for 100 kyat, but before I can get the woman's attention, she has moved on to the next train car. The woman sitting next to me taps me on the shoulder and opens the bag of lychees she has just bought for herself. She shows me how to pull the fruit's skin off and spit out the pit. Afterwards, she throws the plastic bag out the window. The bag sails through the air, against a backdrop of trash that has been following us the whole train route. The city soon disappears into the distance. I can hear the loud hum of motorbikes, a sound that had been so familiar in Thailand but has been nonexistent in Yangon: the government has banned motorbikes in the city. As we move into Yangon's countryside, children eagerly wave from the open windows of small, tin shacks. They lean out of their one-room homes to get a better glimpse of the foreigner on the train, sometimes running alongside the tracks if their legs can carry them that far. They smile wide whenever they see me waving back. Halfway into the trip, a young Burmese boy strikes up the courage to practice his English with me. He wears a red cap with "England" stamped across the front and he tells me he is fifteen. He has headphones in his pocket and he is chewing gum. As the sellers pass through the train again with baskets on their heads, he eagerly points at each of them and lists off all the fruits and snacks they are carrying in English. How does he know English, I ask. I watch TV, he grins. As the train slows to a platform, he says, This is my home. Right over there. He points across a patch of trees, small shacks situated side by side. Bye! he waves, as he jumps off onto the platform, his red hat fading into the distance. As the train continues, we pass men and women up to their knees in water, tending to fields as the sun beats down. Other Burmese collect trash on the side of the tracks, hoping to make a few cents off metal scraps. Dogs with visible rib cages run beside the train. The smell of burning trash wafts through the air at times, tampered only by the occasional rain storms. One of the most touching moments on this train ride was one that I did not even know was taking place. Soren, a fellow backpacker I had met at my hostel, had been sitting across from me for most of the journey. He shared this photo with me afterwards. 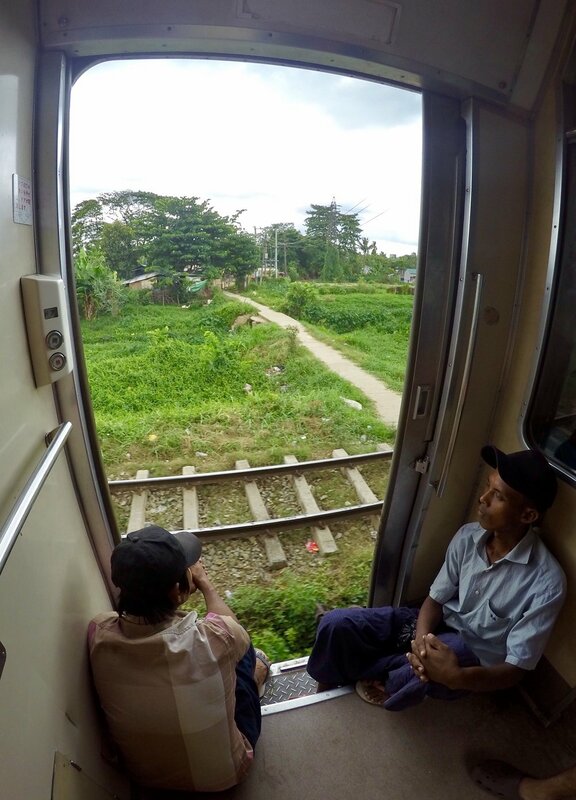 As I am scrolling through photos on my $500 GoPro camera on a train that I paid .12 cents for, two Burmese look curiously over my shoulder. I have no idea. Looking back, I wish I had known; I wish I would have shared this technology with them instead of being absorbed in it. The moment was a stark reminder of two cultures colliding: one of Western consumerism and technology, the other steeped in tradition and a way of life that saw little of the outside world for fifty years. This photo reminded me to stop and look up... to really see and interact with the world around me, instead of scrolling through photos to figure out which one would look best on Instagram. It also provided me with a different perspective. Many people consider Myanmar to be a unique, special place because the country’s lack of accommodation, conveniences, and infrastructure is appealing to those wanting to get off the beaten path. Myanmar is often sensationalized as a travel experience that “goes back in time.” And to be honest, this is one of the reasons I fell in love with Myanmar. But this photo reminds me that Myanmar is only the way it is because its people were brutally oppressed for years by a dictatorship. Its people did not have the choice to embrace Western consumerism and technology. The Burmese were forced to maintain a sense of tradition because they simply were not allowed to move forward, and Myanmar’s economy and quality of life suffered for it. Today, the only way to repair Myanmar’s past is to embrace the future. On the train, the last hour rolls by excruciatingly slow as the afternoon heat intensifies. Finally, after three hours, the train completes its journey around Yangon. I step off onto the platform and back into the chaotic streets of Yangon. I disappear into the fold of Myanmar’s people, content to lose my way again as I pull the curtain back on Myanmar, its culture, and its fight to move forward. How to get there: To purchase a Circular Train ticket, find a ticket window at any platform at the Yangon Central Downtown Station. The ticket should say Yangon-Yangon with a train departure time. If you're not sure what train to get on, ask a local and they will happily make sure you get on the right train. Someone will come around to check your ticket at some point during the journey, so don't lose it.